When I press alt+f2 and want to launch application, I can type but it does something really rarely. Maybe only when started for the first time after login, I'm not sure. OK it doesn't have anything to do with login, it just works suddenly from time to time. I've seen this too, I've noticed if I first click on the empty background (in the area where the icons show up after a successful search) and type in the program I want to open it's not displayed. If I click on one of the bottom icons, then I can select the program, but only if I select the correct filter. for what its worth, I still see this in my unity-2d on precise (and did on oneiric also). It seems that once it *starts* working after login i'm good, but getting it to work the first time requires some random clicking around and re-trying. Shall I open another bug on this? It is very reproducible for me on login. 3. You enter the part or all of an application name, e.g. "gcalct" for "gcaoctool"
What happens for you? What goes wrong? Please reopen this bug if you disagree that the fix is committed. If the bug seems different, please open a new one. I just updated and upgraded my precise system. I also then verified that this same behavior occurs as a new 'demo' user that i created, *and* as the system 'Guest' login, as long as you remember to choose 'Ubuntu 2d'. 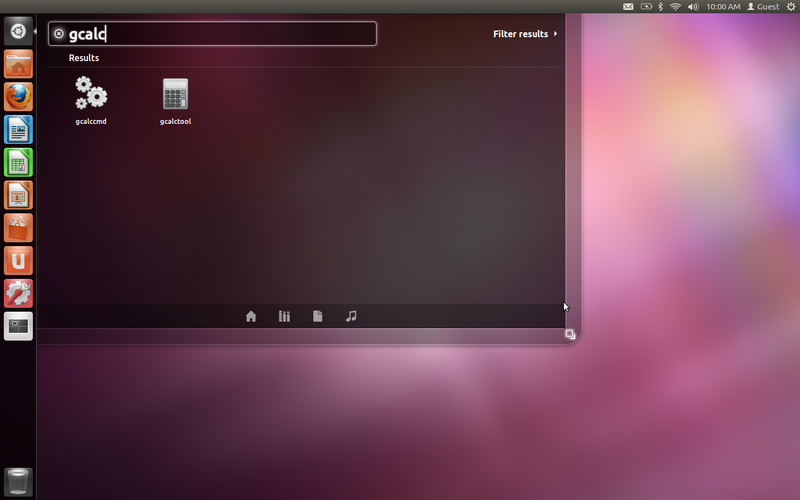 1. login as newly created user, my existing 'smoser', or the system 'guest' user with Ubuntu 2d as the session type. 4. type 'gcalc' . At this point hitting enter does nothing. I am unable to launch a program. 6. press alt-f2. The run dialog generally seems usable now. 7. type 'gcalc', the attached screenshot in 'guest login alt-f2 after screenshot' is what I see. Prior to this excercise I didn't have anything that reproducibly "fixed" the problem. Multiple alt-f2, then 'escape' sequences would still result in the issue, eventually some combination of use of the desktop would make it start working again. It seems hitting PrintScreen fixes it reliably. I just login, wait till crickets are done, then hit 'alt-f2'. I've raised my issues reported in comment as new bug 903279. Thanks Scott, but this bug already exists (bug 883392) and has a fix ready for review in the merge queue. The fix should appear in soon.